The Boston Tea Party is something of a misnomer, as while it did indeed feature tea, it was definitely not a party. 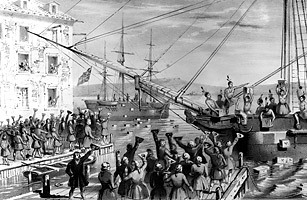 On a cold December evening, protesters gathered in Boston Harbor to reject the latest shipment of tea from the East India Co. They were speaking out against the Tea Act, which allowed the East India Co. to sell its tea at reduced cost, thus giving the British-government-controlled company an effective monopoly. As the story goes, the colonists stormed the ships as they pulled into the harbor and chucked some 46 tons of tea overboard. The real issue at hand, of course, was the colonists' lack of representation in the British Parliament. That night, their cries reverberated near and far and helped spurred a movement that would see the states gain their independence from Mother England in just a few years' time. See pictures of 21st century Tea Party protests.